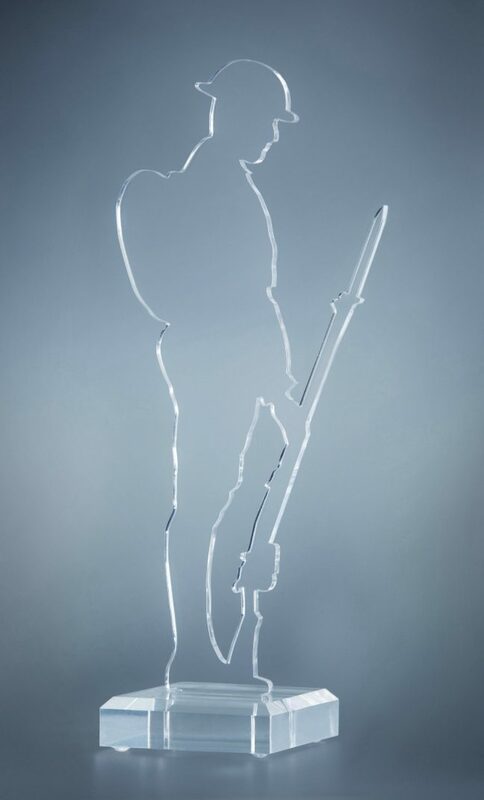 This 10”/25cm high Perspex Tommy figure of a World War One soldier will be delivered to you in beautiful commemorative packaging. You can take it to any Timpsons and, using the voucher below, have it engraved to remember those we have lost. The 2014 ceramic poppies at the Tower of London represented the 888,246 British and Commonwealth Service men and women who lost their lives in the 1914-1918 First World War. The poppies are now in houses and gardens across the world. This Tommy will be the keepsake image commemorating of the centenary of the end of the 1914-1918 war and those who lost their lives. Don’t miss out on getting yours. The funds from the sale of the Tommies will enable Remembered to support the following charities: The Royal Foundation: Heads Together, Walking With The Wounded, Combat Stress, Help for Heroes: Hidden Wounds, The Commonwealth War Graves Foundation and Project Equinox: Housing Veterans. We are honoured that each of the Tommies and their commemorative packaging are made by veterans employed by our manufacturing partner, Royal British Legion Industries (RBLI). Please note: The price of the Tommy is £29.99. Postage and packaging is an additional £3.00 for delivery throughout the UK. Please allow three weeks for delivery.